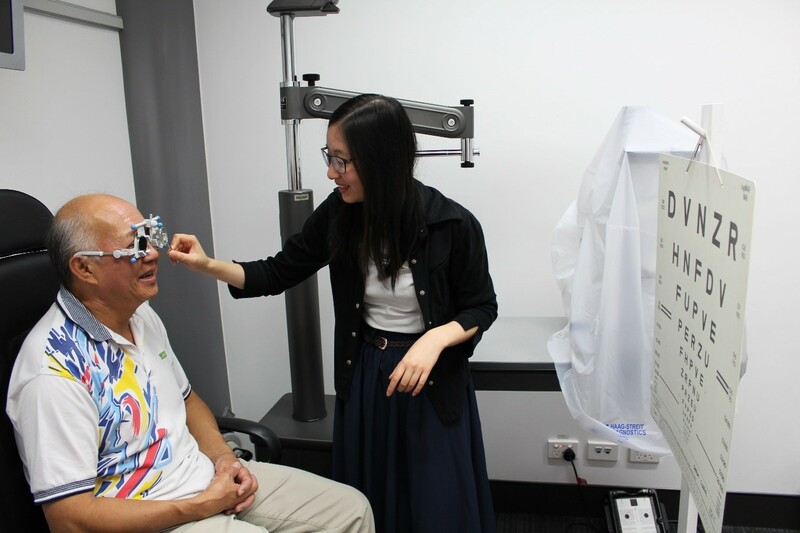 University of Auckland's School of Optometry hosts a low vision learning day. On the 1st of March 2018 the School of Optometry and Vision Science at the University of Auckland held a day for the year 5 Optometry students on the topic of Low Vision. The purpose of the day was to increase knowledge and awareness of the difficulties that people with reduced vision and vision impairments have to face. Volunteers Michael Lloyd, Trevor Plumbly, Camille Guy and Susan Grimsdell captivated the Optometry students with their experiences with vision loss and answered questions during the panel discussion. Katie Webber the Blind Foundation counsellor shared their knowledge on how Optometrists can improve their communication and manner when interacting with people with visual impairments or reduced vision. Samantha Simkin, a PHD candidate at the University of Auckland and Optometrist for BLENNZ explained the services that BLENNZ supplies. Mid-morning the Optometry students got a hands-on experience of technology to assist people who are blind or have low vision during a workshop run by Adaptive technology instructors from the Blind Foundation. The students learnt about how technology such as iPads, cell phones and computers can be adapted to make them more accessible for people with visual impairments. The students accepted the challenge of being blindfolded and correctly guided up and down stairs and to sit in a chair. Thanks to the team of Blind Foundation Orientation and Mobility Instructors who taught them the sighted guide technique and kept the students from crashing into each other. In the afternoon volunteer people with low vision and visual impairments kindly gave up their time to participate in some vision checking such as measurements of their central and peripheral vision and checking their prescription. The Optometry students learnt a lot from the volunteers sharing their experiences and answering questions on daily tasks such as reading, cooking food and walking around. The School of Optometry and Vision Science would like to thank all the wonderful people that were involved in the Low Vision day and especially all those who travelled to Auckland for the day. Thank you to the wonderful support from the Blind Foundation and BLENNZ. Thank you to Macular Degeneration and Retina NZ and all the volunteers who kindly gave up their time to talk to the Optometry students and participate in some vision testing. Another Low Vision day at the School of Optometry and Vision Science at the University of Grafton Campus is being held in March 2019. We will be seeking volunteers with low vision and vision impairments to participate for 2 hours with breaks and afternoon tea included. I would be delighted to hear from anyone who may be interested. Please contact Michelle O’Hanlon, Optometrist and Professional teaching fellow, School of Optometry and Vision Science, The University of Auckland, Private Bag 92019, Victoria Street West Auckland, 1142, Phone: 09 923 6592, Email: m.ohanlon@auckland.ac.nz. Article supplied by Michelle O’Hanlon, Optometrist and Professional Teaching Fellow, University of Auckland.